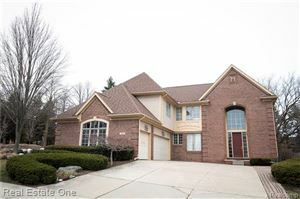 MAGNIFICENT 4 bedroom, 4.2 bath Colonial with 4473 sf of living space situated in highly sought Stony Pointe! Immaculately kept & finely detailed throughout this home. Newly renovated kitchen with granite, lots of cabinet storage & working area, SS appl, walk-in pantry. 2 story GR with amazing views! 4 spacious bedrooms on upper level, BR2 with own bathroom, BR3&4 with dual entry bathroom & the MBR with cathedral ceiling, powder room, lg Master Bath with jetted tub, sep shower exquisitely finished. Additional features include humidifier, air cleaner, security alarm, invisible fenced yard, 1st fl laundry, wood flooring, 3 car insulated garage doors, wood covered den with french doors & built-in bookshelves. Exterior painted 2016. Enjoy exquisite views of the large, private yard from the Trex deck watching Stony Creek flowing by or on the paver patio below. Fully finished walkout basement with wet bar/2nd kitchen, 5th BR or exercise room, fully finished bathroom. Must see to appreciate!